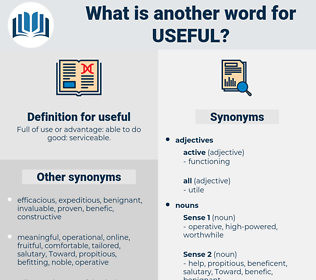 What is another word for useful? Full of use or advantage: able to do good: serviceable. 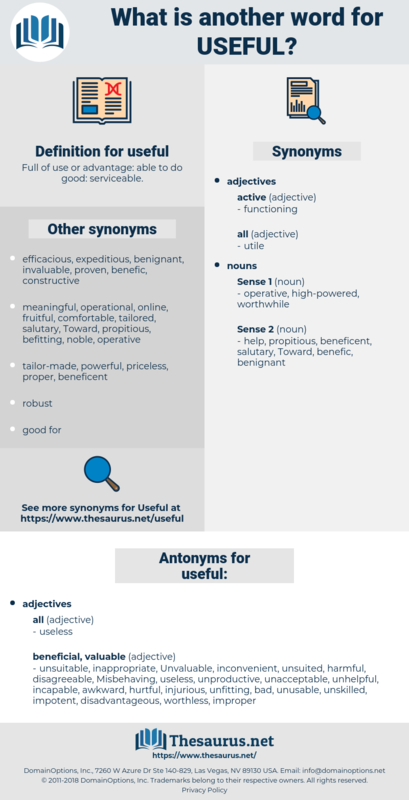 useless, important, positive, favourable, used, effectual, exploitable, powerful, favorable, proper, futile, utilitarian, essential, unnecessary, practicable, pointless, influential, sufficient, interested, ineffective, inappropriate, judicious, thoughtful. purposes, Lives, expectancies, cycles, inputs, positions. valued, Helped, Benefited, appreciated, noted, Asked, added, said, used. valued, Helped, illustrated, welcomed, appreciated, suited, warranted, spent, pointed, used. worthwhile, advantageous, fruitful, successful, desirable, salutary, instructive, interesting, instrumental, invaluable, sensible, useable, productive, suitable, feasible, expedient, profitable, unhelpful, informative, constructive, conducive, workable, precious, reasonable, rewarding, insightful, significant, valuable, excellent, viable, worthy, attractive, timely, wise, opportune, advisable, enlightening, preferable, available, supportive, propitious, healthy, usable, wonderful, exciting, fine, beneficial. unhelpful, awkward, unproductive, unskilled, Unvaluable, injurious, worthless, inappropriate, unacceptable, Misbehaving, unfitting, inconvenient, disadvantageous, bad, Unhandy, unsuited, unusable, impotent, incapable, harmful, disagreeable, improper, unsuitable, hurtful. At this time he was twenty - two, and was making himself useful. Tillotson is a kind of useful man to them.